David started volunteering at the Lakes Area Nourish Food Bank when he was in high school. He was told that he needed community service hours to graduate and the school presented him a list of places to choose from. A family member had relied on a food bank in the past, so he picked the Lakewood based food bank from the list. David did not stop when he completed his community service hours. Three years later, David is still volunteering. He keeps a regular schedule and volunteers three days each week. David helps out in many ways. He works the check-in desk, greeting clients when they first arrive and keeps the shelves stocked with food. 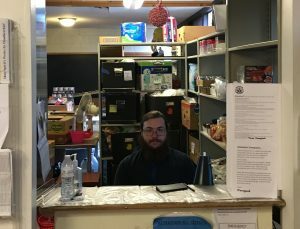 When the food bank is not open, he works with the grocery recovery team, helping to collect food from grocery stores that donate products to the food bank. He sees the value in what he does for the community. “The food bank gives people who are in a slump an opportunity. It is not only about food, but it also provides happiness. You come here and you feel happy. The people here want to give you what you need.” David says. Join David and visit our Volunteer page to sign up.